Thicker Sludge: Settles Better. Decants Clearer. Disposes Easier. Do you spend too much money hauling sludge? Do you have trouble land applying? BugJuice contains a biochemical catalyst, developed by our lab, that when added into a wastewater treatment plant, digestor or sludge storage tank it degrades all the grease, oils, waxes and papers the bacteria cannot. This turns the insoluble materials into food for the bacteria, creating less sludge. This improves settling, creates a denser sludge and gives you much less to haul. It’s far cheaper than diesel. Many small cities have saved over $20,000 by hauling less sludge. *55 gallons available at $64.00 per gallon, please call to order 888-757-9577. 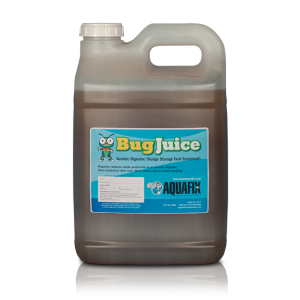 What can BugJuice do for your digester? The catalysts in BugJuice convert insoluble BOD to soluble simple sugars and materials so the bacteria can digest it. This process promotes great sludge reduction. Many new wastewater treatment plants do not have primary treatment. This means the aeration basin catches everything including hard-to-digest fats, surfactants, paper products, and complex chemistries sent by industries. In other words, all the insoluble BOD goes into the digester or sludge storage tank, and BugJuice is going to significantly reduce it. Four years ago we visited Jim, a watewater operator who wanted a product to put in his aerobic digester to reduce sludge and save hauling costs. Our lab researched and ran tests to understand why certain materials and solids were not breaking down properly. It took two years to create a biochemical catalyst this powerful and helpful to the bacteria. We took it to Jim, and it improved his settling and reduced his hauling by 40%. Jim and many operators continue to use our BugJuice and swear by it. This municipality operates a 300,000 gpd activated sludge plant. All of their solids from their plant goes into one of two 100,000 gallon digestors. Monthly one of the digestors is hauled off to a field for land application. It costs roughly $4000 per month to haul sludge. The Case Study graphs show how their percent solids and wasting schedule compares before and after treatment. Note: Pour dose all at once over aeration or mixing. 1 pint per 100,000 GPD into the front end of plant until red worms are gone. 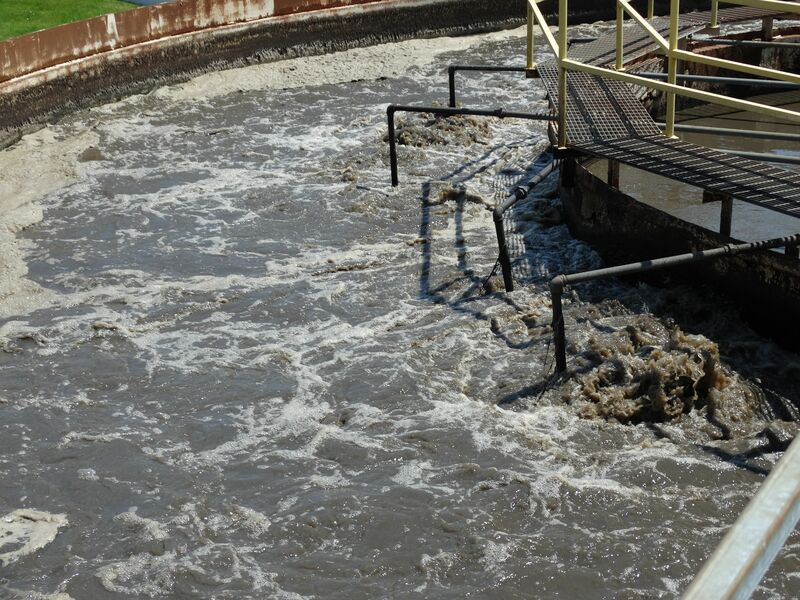 A wastewater treatment plant located at a correctional facility in Wisconsin operates an oxidation ditch with a primary flow of 150,000 gallons per day. They have two sludge storage tanks that were filled to the brim. This caused them to haul sludge often, costing them thousands of dollars each year. To reduce hauling, this summer (2014) the operators applied 5 gallons of BugJuice initially and then dropped back to ½ a gallon per week. The biochemical catalysts went to work by degrading the immense sludge buildup caused by papers and grease from the correctional facility. By November 2014, the sludge levels dropped two-thirds. The sludge thickened and went from 1.4% to 3%. The operator calculated a savings of $17,000 in sludge hauling costs. One municipality operates a 300,000 gpd activated sludge plant. All of their solids go into one of two 100,000 gallon digestors. Once a month one of the digesters is hauled off to a field for land application. It cost roughly $4,000 per month to haul sludge. They added 1 gallon per 100,000 gallons per week. This municipality reduced the amount of sludge hauled by 86,500 gallons. A small city in southern Wisconsin operates a wastewater plant with a 100,000 gallon digestor. They are always looking for the best way to haul less sludge. Their sludge was between 2.0% to 2.5% thick and they were hauling every two months. It cost them $5,000 every time they hauled. They began adding Foam Buster and BugJuice. Solids went up to 3.0% to 3.5% and they reduced their hauling to every four months. This program was able to save this small city $15,000 per year. Improve belt press dewatering of activated sludge A municipal wastewater operator called looking to improve his belt press dewatering. He said “It’s not dewatering properly. Instead of a nice solid cake we have a slimy mess, and our belt filter press keeps blinding “. He went on to explain that despite increasing their polymer use the situation wasn’t improving. Problems like blinding of the belt press are often related to the health of the biological populations, filaments, zooglea and polysaccharide formation all play a role. The operator sent a sample to our lab and we found the filaments Nocardia and Microthrix, in addition we found high levels of polysaccharide slime. All three are common in systems with high fats, oils and grease and long sludge ages. 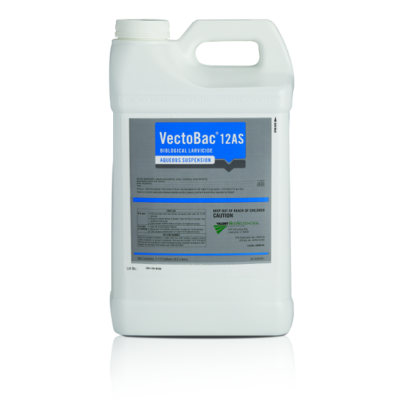 The biocatalysts in BugJuice convert insoluble BOD to soluble BOD that is assimulated by bacteria. In this case grease and surfactants is what we had to breakdown. For this 1 MGD plant, the operator used 2.5 gallons per week for the first month and then dropped back to 1 gallon of BugJuice per week per digester. BugJuice is added straight into the digester. Within two weeks the sludge began dewatering better. In four weeks their sludge cake solids increased from 8% to 13%, a huge improvement in density and quality. 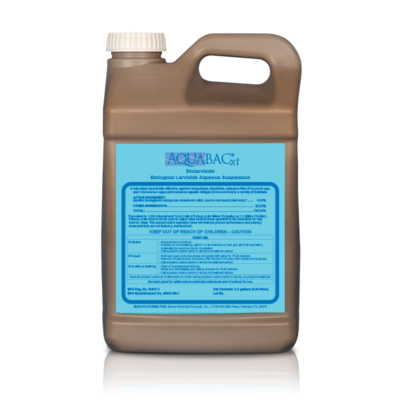 BugJuice increased the percent solids by first breaking down the fats, oils, grease, paper, waxes and surfactants that had refused to break down before. The bacteria in the digester were then able to utilize the newly-soluble BOD sources, reducing polysaccarides to further refine the sludge. The result is a sludge that isn’t blinding the press, is holding less moisture, and can be compacted into a better cake. 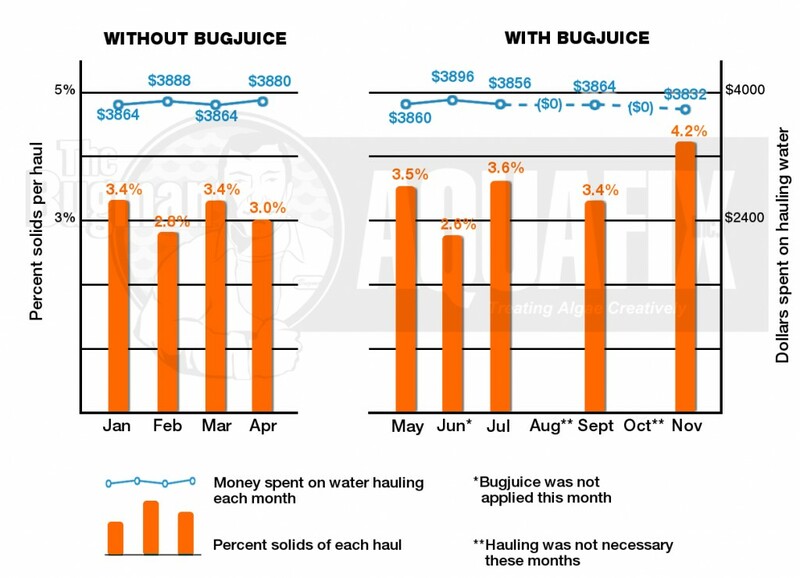 The cost of BugJuice has been more than offset by the decrease in hauling costs and lower polymer bills. Fantastic product! Increased my aerobic digester sludge from 1.7% to 3.7%. Cut my sludge hauling by half! If you don’t completely empty your digester when hauling, the remaing sludge with bug juice will reseed and very addtional product is needed to maintain. What the heck is in this stuff, my settling has improved and I am hauling about 1/2 of what I was! We were always having problems getting our digester to settle, BugJuice really helped, we really saved on polymer too. Our polymer use has been cut in half since using the Bug Juice. With the price of polymer going up and up, using the Bug Juice to reduce our sludge production really pays off. I highly recommend it. Bug Juice Rocks.